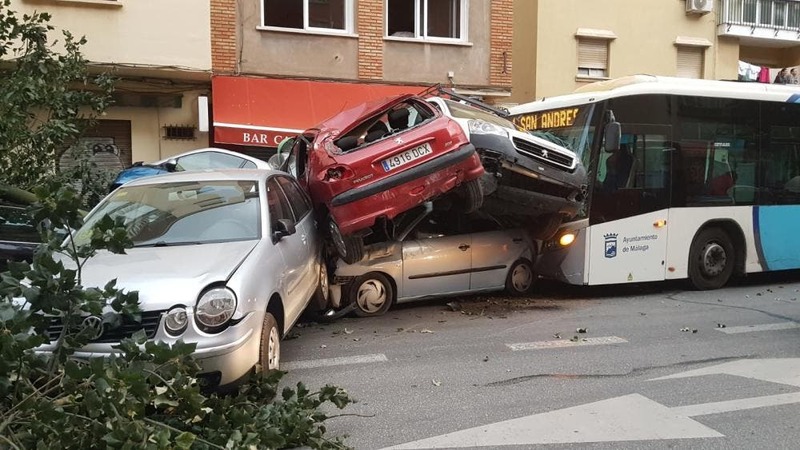 A CAREERING bus has left a trail of destruction in Malaga after the driver suffered a heart attack while at the wheel. The-out-of-control EMT bus flipped several parked cars in Hero de Sostoa street and up rooted trees before coming to a stop. Passenger alerted emergency services after the driver suffered a ‘fading,’ he was later found to have suffered a cardio respiratory arrest. First responders managed to stabilise the man, who was later transferred by ambulance to the Regional Hospital of Malaga. Despite the carnage no one else was injured but thirteen passengers were trapped inside the bus after the doors were damaged.